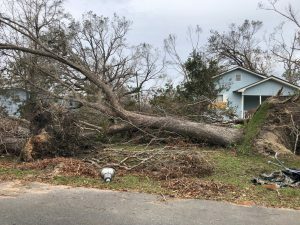 It has been more than two weeks since devastating Hurricane Michael landed hard on the coast of Florida. Central-Panhandle counties from the Gulf to the Alabama line are in full recovery mode, struggling to return to normal after many days without power and clean water. A strong category 4 hurricane, Michael brought sustained winds of 155 mph, with gusts likely much higher—many instruments that measured wind speed failed and blew away with the onslaught of the storm. Unfortunately, with winds this strong, trees of every shape and description blew down, bringing with them serious damage to homes, vehicles, and power lines. In the immediate aftermath of a storm, it is important to perform “tree triage” using the same method as emergency room personnel as they decide which patients to treat first, based on urgency. Hazard trees causing or leading to unsafe conditions should be given priority. These would be limbs and trunks on top of houses, power lines, blocking roads, or leaning in precarious situations that could blow down on people or property. Once roads are cleared and dangerous trees and limbs are removed, homeowners can move their attention to downed trees that are lying out of harm’s way or leaning away from property. It is important to remember that many injuries from hurricanes happen after a storm—often when physically and emotionally exhausted storm victims are using heavy machinery at elevated heights. Always be willing to ask for help, whether from volunteers, neighbors, or landscape professionals. Use proper safety precautions when utilizing chainsaws, ladders, tractors, and other machinery. On a more positive note, many trees can be salvaged after a storm. In particular, younger, newly planted trees can often be righted or pruned and still grow to maturity. Don’t fall into the trap of clearing every tree from your property—healthy or not—out of fear. Trees are extraordinarily valuable, and particularly with all of the tree loss it is more important than ever to save as many trees as you can. These trees will provide much-needed shade, oxygen, air and stormwater filtration, and wildlife habitat. Learn the names of your trees that survived or had less damage, and plant more of those after recovery. Many long-lived species like magnolia, live oak, and cypress can weather storms better than other species. 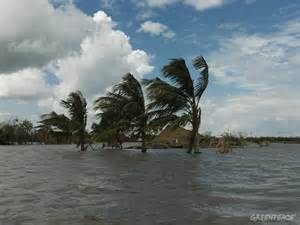 It is important to continue monitoring any surviving trees for damage. Many trees, particularly pines, can be susceptible to disease, insect damage, and fungus after a storm and it may be several months before the damage is fully evident. After Hurricane Ivan, many pine forests and individual trees that survived the storm were lost to pine bark beetles within the following year. 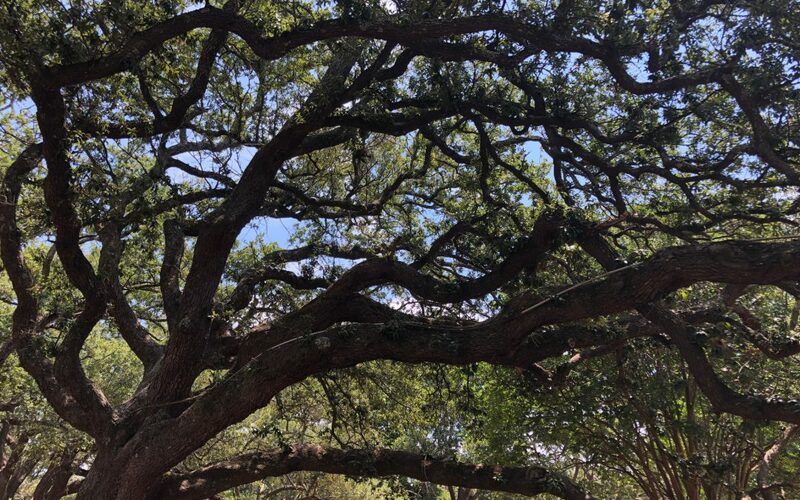 For detailed information on tree assessment and making wise decisions, the IFAS Trees and Hurricanes publication has great photos and examples. Be sure to check it out and contact your local county Extension office if you have questions. 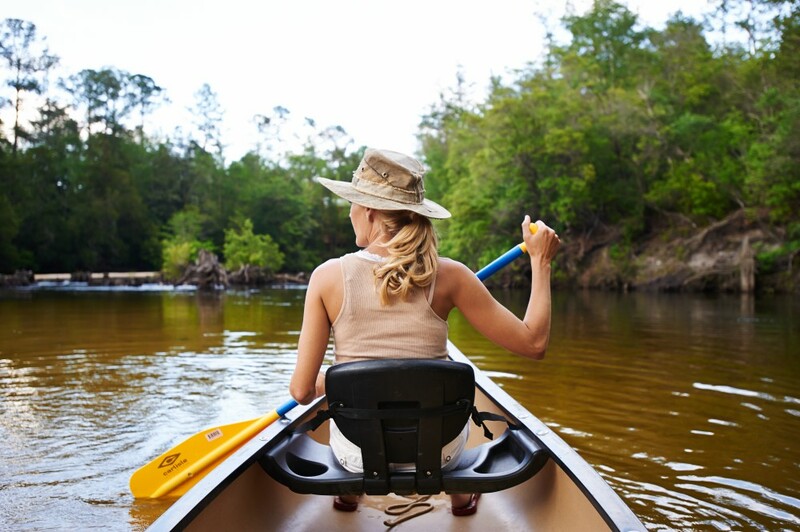 Florida’s rivers, springs, wetlands, and estuaries are central features to the identity of northwest Florida. They provide a wide range of services that benefit peoples’ health and well-being in our region. They create recreational opportunities for swimmers, canoers, and kayakers; support diverse wildlife for birders and plant enthusiasts; sustain a vibrant commercial and recreational fishery and shellfishery; serve as corridors for shipping and transportation; and support ecosystems that help to improve water quality. Maintaining these aquatic ecosystem services requires a low level of chemical inputs from the upstream areas that comprise their watersheds. Aquatic ecosystems are especially sensitive to nitrogen and phosphorus, which are key nutrients for the growth of plants, algae, and bacteria that live in these waters. High levels of these nutrients combined with our sunny weather and warm summer temperatures create conditions that can lead to rapid growth of aquatic plants and algae, which can cover these water bodies and make them no longer enjoyable for people and wildlife. It can also cause dissolved oxygen levels to fall, as plants respire (especially at night, when they are not photosynthesizing) and as bacteria consume oxygen to break down dead plant material. Low dissolved oxygen can create conditions that are deadly for fish and shellfish. 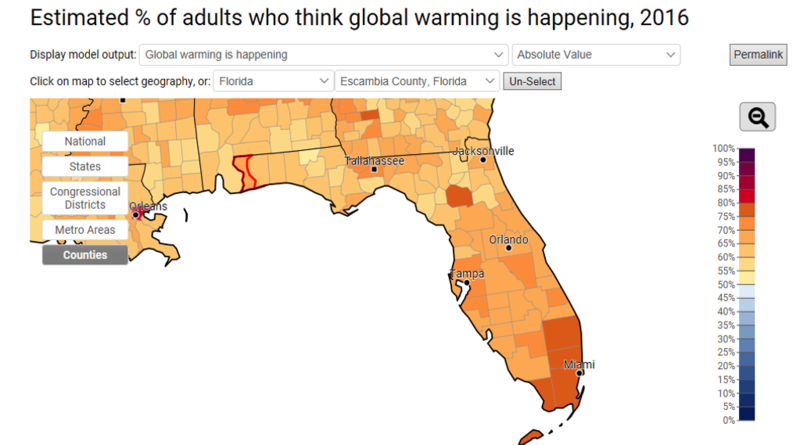 The Florida Department of Environmental Protection (FDEP) lists more than 1,400 water bodies (including rivers, springs, wetlands, and estuaries) as impaired by pollutants. Many of these are impaired by excessive nitrogen or phosphorus. It is a daunting challenge to reduce pollutants in these water bodies because their inputs frequently come from all over the landscape, rather than a specific point—nutrients can come from agricultural fields, residential landscapes, septic tanks, atmospheric deposition, and livestock throughout the watershed. 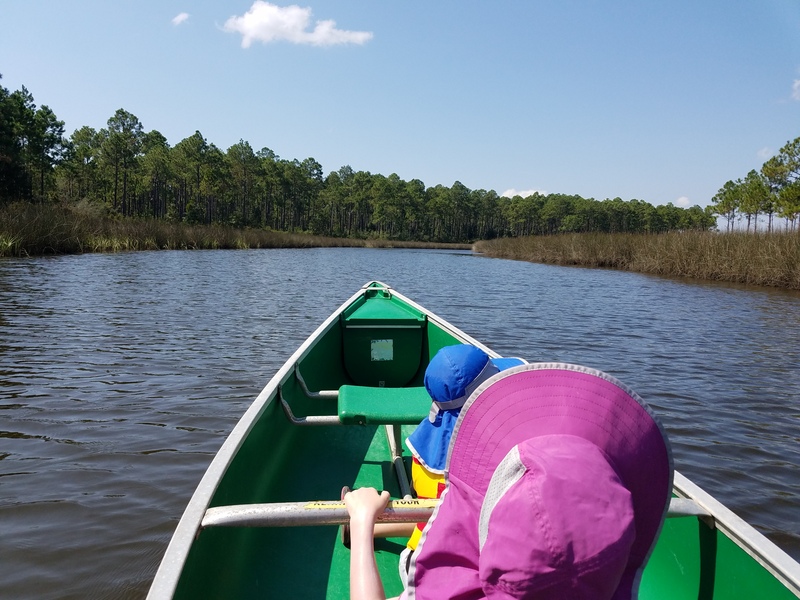 In Florida, FDEP has begun a program to reduce nutrient concentrations in impaired watersheds by collaborating with landowners and other stakeholders to develop management programs to reduce pollutants entering the state’s waters. This pollutant reduction program is currently focused on Florida’s spring systems, including Jackson Blue Spring and Merritt’s Mill Pond in Jackson County. Merritt’s Mill Pond is a 4-mile long, 270-acre pond located near Marianna, and it is a popular regional destination for swimming, boating, kayaking, and fishing in the Panhandle. Its main source is Jackson Blue Spring, which produces, on average, more than 70 million gallons of water each day. Excessive growth of aquatic plants and algae in the pond during summer reduces the area available for swimming and boating. In 2014, FDEP began working with agricultural producers, residents, developers, local government officials, and other stakeholders to identify nutrient contributions in the Merritt’s Mill Pond watershed and develop an action plan to reduce nutrients entering the pond in the coming decades. Collaborations with stakeholders help to improve the accuracy of pollutant estimates, and to ensure the plan is designed appropriately to achieve desired ecological outcomes. This Action Plan for reducing nutrients into Merritt’s Mill Pond provides an opportunity for land managers to implement their own plans to reduce nutrient contributions without FDEP imposing rigid regulations or mandating particular actions. People can choose from an array of Best Management Practices designed to reduce nutrient contributions, and the state has made funds available for people to help implement these plans. Implementing this Action Plan will restore the wonders of Merritt’s Mill through the 21st Century. This article was written by: Matthew J Deitch, PhD, Assistant Professor, Watershed Management with the UF IFAS Soil and Water Sciences Department at the West Florida Research and Education Center. For more information, you can contact him at mdeitch@ufl.edu or 850-377-2592. Standing in the midst of a stand of bamboo, it’s easy to feel dwarfed. Smooth and sturdy, the hollow, sectioned woody shoots of this fascinating plant can tower as tall as 70 feet. Unfortunately, bamboo is a real threat to natural ecosystems, moving quickly through wooded areas, wetlands, and neighborhoods, taking out native species as it goes. We do have one native species referred to as bamboo or cane (Arundinaria gigantea), which is found in reasonable numbers in southeastern wetlands and the banks of rivers. There are over a thousand species of true bamboo, but chief among the invasive varieties that give us trouble is Golden Bamboo (Phyllostachys aurea). Grown in its native Southeast Asia as a food source, building material, or for fishing rods, bamboo is also well known as the primary diet (99%) of the giant panda. In the United States, the plant was brought in as an ornamental—a fast growing vegetative screen that can also be used as flooring material or food. 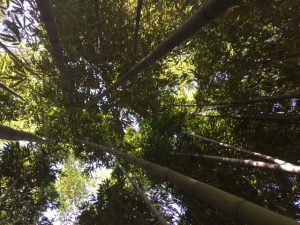 Clumping bamboos can be managed in a landscape, but the invasive, spreading bamboo will grow aggressively via roots and an extensive network of underground rhizomes that might extend more than 100 feet from their origin. As a perennial grass, bamboo grows straight up, quickly, and can withstand occasional cutting and mowing without impacts to its overall health. However, a repeated program of intensive mowing, as often as you’d mow a lawn and over several years, will be needed to keep the plant under control. Small patches can be dug up, and there has been some success with containing the rhizomes by installing an underground “wall” of wood, plastic, or metal 18” into the soil around a section of bamboo. While there are currently no chemical methods of control specifically labeled for bamboo at this time, the herbicides imazapyr (trade name Arsenal and others) or glyphosate (Round-up, Rodeo) applied at high rates can control it. According to research on the topic, “bamboo should be mowed or chopped and allowed to regrow to a height of approximately 3 feet, or until the leaves expand. Glyphosate at a 5% solution or imazapyr as a 1% solution can then be applied directly to the leaves.” These treatments will often need to be repeated as many as four times before succeeding in complete control of bamboo. 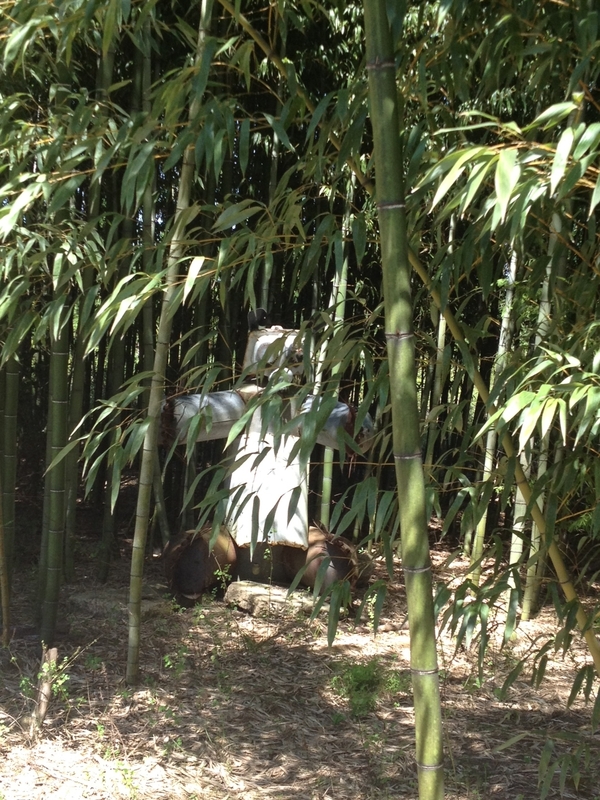 Land managers should know that while imazapyr is typically a more effective herbicide for bamboo, it can kill surrounding beneficial trees and shrubs due to its persistence in the contiguous roots and soil. In contrast, glyphosate solutions will only kill the species to which it has been applied and is the best choice for most areas managed by homeowners. Imagine you are enjoying perfect fall weather on a hike with your family, when suddenly you come upon a ghost. Translucent white, small and creeping out of the ground behind a tree, you stop and look closer to figure out what it is you’ve just seen. 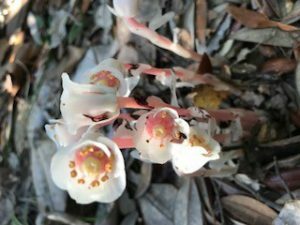 In such an environment, the “ghost” you might come across is the perennial wildflower known as the ghost plant (Monotropa uniflora, also known as Indian pipe). Maybe it’s not the same spirit from the creepy story during last night’s campfire, but it’s quite unexpected, nonetheless. The plant is an unusual shade of white because it does not photosynthesize like most plants, and therefore does not create cholorophyll needed for green leaves. In deeply shaded forests, a thick layer of fallen leaves, dead branches, and even decaying animals forms a thick mulch around tree bases. This humus layer is warm and holds moisture, creating the perfect environment for mushrooms and other fungi to grow. 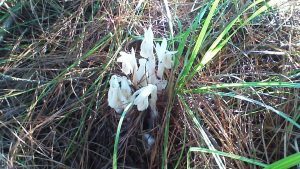 Because there is very little sunlight filtering down to the forest floor, the ghost flower plant adapted to this shady, wet environment by parasitizing the fungi growing in the woods. 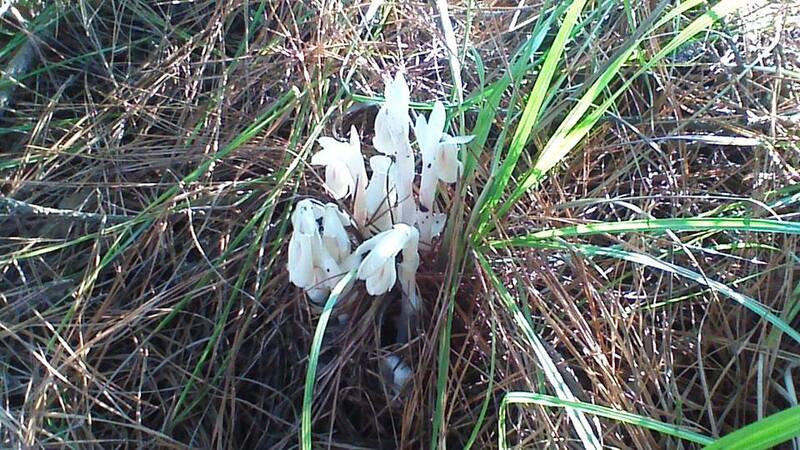 Ghost plants and their close relatives are known as mycotrophs (myco: fungus, troph: feeding). These plants were once called saprophytes (sapro: rotten, phyte: plant), with the assumption that they fed directly on decaying matter in the same way as fungi. They even look like mushrooms when emerging from the soil. However, research has shown the relationship is much more complex. While many trees have symbiotic relationships with fungi living among their root systems, the mycotrophs actually capitalize on that relationship, tapping into in the flow of carbon between trees and fungi and taking their nutrients. Mycotrophs grow throughout the United States except in the southwest and Rockies, although they are a somewhat rare find. The ghost plant is mostly a translucent shade of white, but has some pale pink and black spots. The flower points down when it emerges (looking like its “pipe” nickname) but opens up and releases seed as it matures. They are usually found in a cluster of several blooms. The next time you explore the forests around you, look down—you just might see a ghost!